With first-of-its kind design features, the Bosch 4100-09 10-Inch Worksite Table Saw with Gravity-Rise Stand (TS3000) is built for effortless, efficient, and accurate cutting that lets you deliver products faster. And with its portable construction, which allows for transfer across even the roughest terrain, it makes an ideal addition to any work site. The innovative Gravity-Rise Stand (TS3000) uses patented technology to make setup and take down quicker than ever, so you can spend more time working. And it's extremely portable: the eight-inch treaded pneumatic wheels can handle the toughest terrain with ease, and the collapsible design minimizes storage space requirements, so transporting this stand to, from, and around the jobsite is a breeze. This stand may be lightweight at 39 pounds, but it's built for durability, sporting a powder-coat finish for longevity. 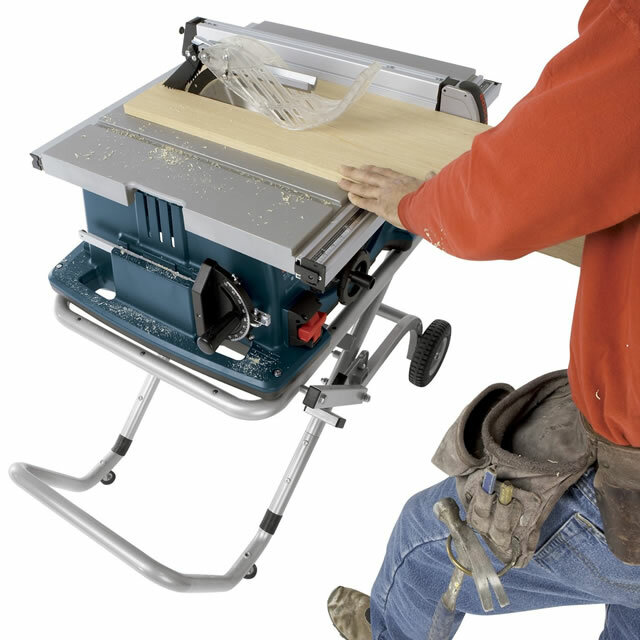 The 15 Amp, 10-inch table saw generates a maximum 4 HP and 3,650 RPM for exceptionally clean cuts. Additionally, the tool features soft-start and Constant Response electronics for exceptional power management and constant speed under load. It features a 5/8-inch arbor size for use with compatible blades and will make bevel cuts between -2 and 47 degrees in addition to dado cuts up to 13/16 inch. An optional, unique easy-to-read digital measuring display (DC010, not included) can be attached to the fence to take measurements for cuts within 1/32 of an inch. Made from precision machined aluminum for rugged durability and long life, the 29 x 21.5 inch cutting table easily handles large stock for greater ripping capacity up to 25 inches wide.The best-in-class Squarelock Rip Fence is engineered for maximum trueness, so you get maximum accuracy with every cut. The innovative rip fence glides across the cutting table with ease for simple one-handed operation, and it locks in place for making consistent precise cuts. The first-of-its-kind Smart Guard System is a completely tool-free design that provides unparalleled visibility and enhanced user protection, so you can see the cuts better while helping avoid kickback or blade contact. The modular three-piece system includes a built-in riving knife, blade guard and anti-kickback pawls, all which install within seconds and require no tools. 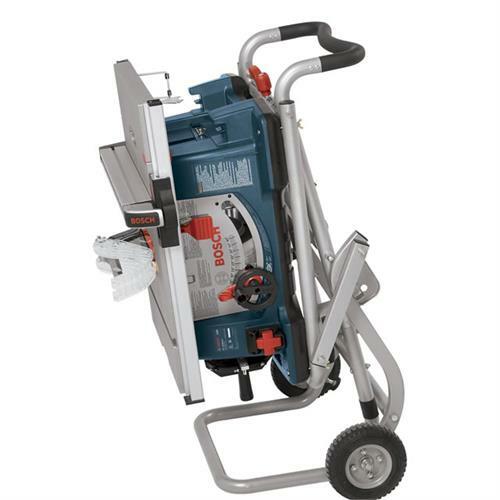 The Bosch 4100-09 10-Inch Table Saw with Gravity-Rise Stand measures 39.13 x 30 x 20.9 inches and weighs 99 pounds (saw and stand). It is backed by a one-year limited warranty, 30-day money back guarantee, and one-year service protection plan. 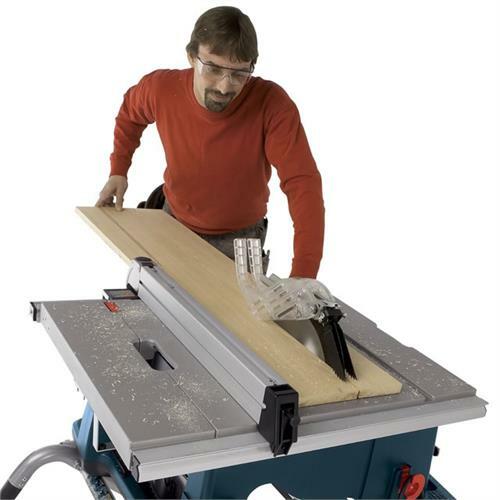 •With the Bosch 4100 09 table saw the Bosch award winning Gravity-Rise Stand (TS3000) is included with the unit. This stand is a real dream to operate whether at home or on your work-site. It is highly portable with a great set of 8″ pneumatic wheels that handle any terrain with ease. The stand is very durable and you can setup and take down the stand very quickly and with no real effort. Many people collapse the stand with the saw still attached for neat storage in small places and for transporting. •This 15 amp 10-inch unit delivers constant smooth power while cutting even at high loads thanks to Bosch’s Constant Response Circuitry. This technology monitors the power and delivers more torque when needed when load increases while cutting. The Soft Start technology also allows the Bosch 4100 09 table saw to operate smoother and quieter than other brands of table saws. •Bosch’s new Smart Guard System is a great new safety feature with a quick and easy-to-use modular blade guard, anti-kickback pawls and riving knife. As mentioned all 3 of these elements are modular and require no tools to remove or add either of them when needed. The newly designed blade guard that works independently to one another is new system that provides superior control over the material while cutting and offers maximum protection when using the unit. •This unit includes the standard precision machined aluminium Squarelock™ Rip Fence which has been engineered for maximum trueness and rugged durability. The fence effortlessly glides along the rail at a finger’s touch or locks into place for solid and consistent cutting performance. 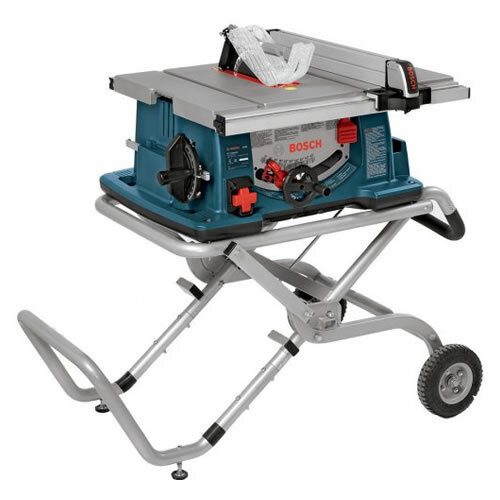 •The Bosch 4100 09 Table Saw has a large 29 x 21.5inch Machined Aluminum Tabletop , actually the largest in it’s class and will handle larger stock/timber for a increased ripping capacity. •Another great feature is the On-tool storage for all saw attachments and tools. There is storage on the unit for the Smart Guard System, Fence and Miter Gauge, and Push Stick.